Of the 21 short stories included in Simon & Schuster’s original Great Tales and Poems of Edgar Allan Poe (1940), 14 have been adapted into full-length motion pictures. Of the seven that have not, three are six pages or less, one has been adapted into a television program, and another has inspired an hour-long musical movement by composer Philip Glass. Not bad for a 19th century writer who married his 13-year old cousin, 14 years before being found dead in the gutter. And yet, when it comes to replicating Poe on film, the results have not been favorable. Roger Corman and Vincent Price shared a decent run throughout the sixties, capitalizing on the idea that all Poe’s darkness begged a little light. In the half-century since, however, major studios have struggled, in large part because they insist upon transforming brilliant source material into something to be ogled – a gothic-era fairy tale, if you will, featuring minor elements of Poe. All of which brings us to Stonehearst Asylum. At a distance, Stonehearst appears credible enough, Brad Anderson’s set-up maintaining at least some modicum of Poe’s original short story. The deeper Stonehearst gets, however, the more suspension of disbelief becomes an issue. Anderson keeps toying with the audience here, his film immeasurably stricken by its allegiance to a series of weak plot twists. Ben Kingsley somehow manages to maintain his dignity throughout, and the same can be said for Michael Caine, although he’s wildly misused. Kate Beckinsale appears equal parts beautiful-yet-boring, and Jim Sturgess evokes all the presence of a turd. In the end Stonehearst Asylum fails because it insists upon applying 21st century movie tropes to a 170-year-old short story (regarding the sociopolitical machinations of southern France, no less). The inmates are running the asylum, sure. But who are these inmates, and under what circumstances did they usurp this level of authority? Screenwriter Joe Gangemi tosses a great deal of Poe’s metaphorical commentary out the window, treating the audience instead to an ever-maddening shell game, the finality of which leaves one feeling duped. Gangemi’s thesis, kept under wraps until the final moments, has something to do with mental illness representing a lack of acceptance, or fulfillment, or love, or something equally silly. 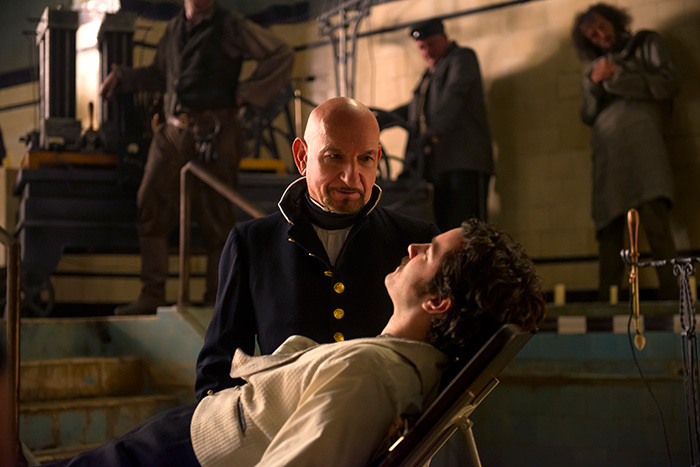 Whatever it is Stonehearst Asylum happens to be about, it’s a far cry from Edgar Allan Poe’s original intention, and even further removed from what any modern audience has come to appreciate about the cinema. The film stars Kate Beckinsale, Jim Sturgess, Sir Ben Kingsley, Michael Caine, and Sophie Kennedy Clark. Also don’t miss our exclusive interview with Kennedy Clark about her role in Stonehearst Asylum as well as other films, in addition to photos of her shoot with photographer Simon Emmett for The Untitled Magazine.